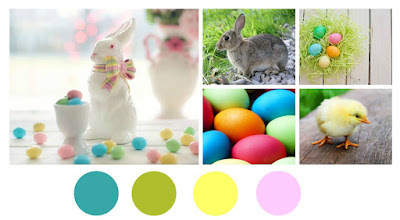 There is a fabulous new mood board over at SumMore Fun and it is filled with beautiful spring colors and images. I started with a dark turquoise A2 sized side folding card base and then found an adorable sheet of designer paper with the colors on the mood board that matched perfectly. I cut the designer paper with a stitched rectangle die in my stash and then popped that up with fun foam onto my card base. I then took the adorable Victorine Originals stamp "Bunny With Egg" and stamped it with Dark Walnut Ink onto a piece of Kraft card stock. I colored the bunny with colored pencils in white and cool grays, adding pink to the cheeks, nose and feet. On the tail I colored it in with white pencil then added Ranger Liquid Pearls in White Opal to the top. I paper pieced the egg with a pretty piece of marbled blue and white paper and then added a coat of Tonic Glitter Gloss Aqua Shimmer pen, this was the first time I have actually paper pieced and I really liked the results, it gave the stamped image some added dimension. I then fussy cut the bunny, added lots of small pieces of fun foam and popped him up onto the card. I finished it off by stamping the sentiment "You're Some "Bunny" Special!" onto Kraft card stock with Dark Walnut Ink and then heat embossing with clear embossing powder then placing the sentiment below the bunny. I am super happy with how it all turned out and hope you will join us at the new challenge. Wild About Spring (and Ewe)!